MONARFLEX Reflex Super is a high performance, six layer membrane manufactured from virgin low density polyethylene (LDPE) with a polyester reinforcing grid and an aluminium foil layer to give high strength, tear resistance and low permeability to gas. The membrane is coloured sand on the upper surface with a silver coloured underside. Installation of a gas barrier must only be carried out by professionals. 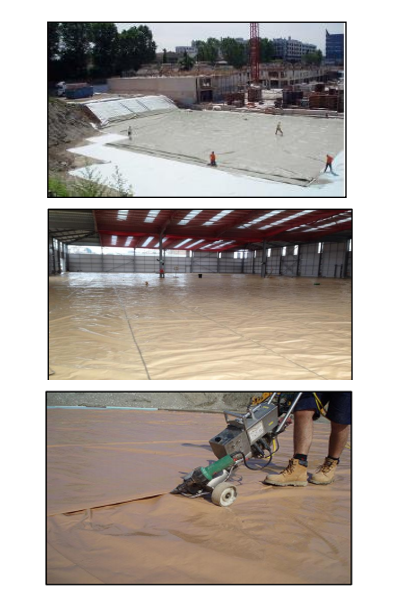 To form joints between adjacent sheets of Monarflex Reflex Super, lap the membrane by a minimum of 150 mm and seal. Where methane or carbon dioxide are present, the membrane should be extrusion welded at all laps and joints where possible.